Happy July, y’all! 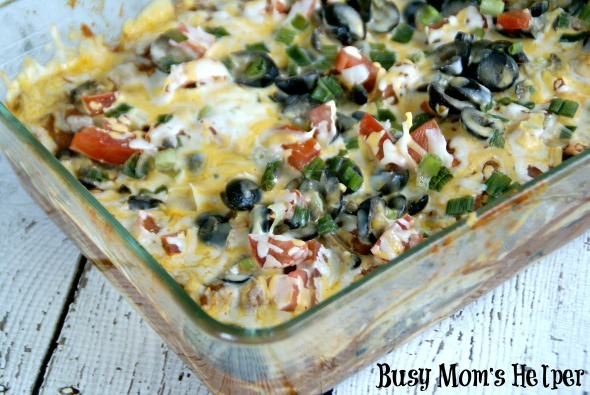 It’s Danielle again from Busy Mom’s Helper, sharing another simple yet VERY tasty recipe today! After all, who has time during the busy summer months to spend forever on dinner? Not me! 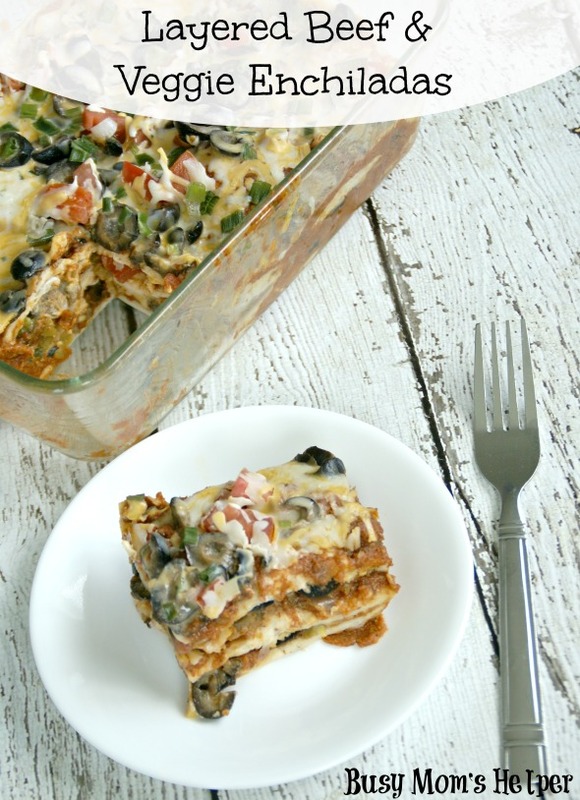 You still want to please those taste buds, though, and these Layered Beef & Veggie Enchiladas are so full of flavor, and you can adjust it to your perfect spicy level. One of the best things about these Layered Beef & Veggie Enchiladas is that you can completely change the amounts of the ingredients and layers based on YOUR preferences. Like a lot of cheese? Add more. Hate mushrooms? Leave them out. Use your favorite type of tortilla! This is the type of recipe that you can custom fit to your tastes, leaving one very happy tummy! Cook the Ground Beef in a skillet until meat is fully done. Remove from heat and mix in the Onion, Green Chiles and 1/2 tsp. Salt. In a sauce pan heat the Enchilada Sauce, Flour, 1/2 tsp. Salt, Pepper and Cilantro until it comes to a boil. Reduce heat and simmer 30 minutes. Remove from heat and mix in the Refried Beans. Preheat oven to 350 Degrees F. Spray or line a deep 9×13 baking pan. For the layers: One layer tortillas, 1 cup sauce mixture, 1 cup meat mixture, sprinkle with Tomatoes, Green Peppers, Mushrooms and Olives, 1/2-1 cup Cheese. Repeat this for 2 more layers. 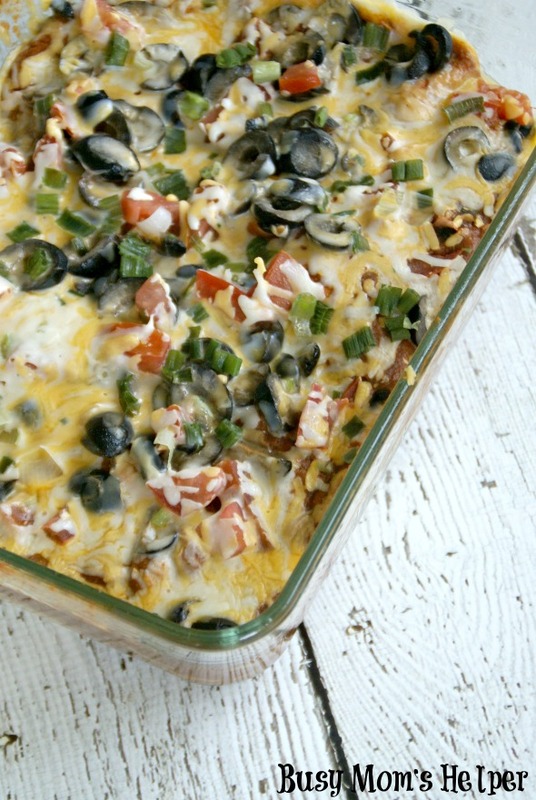 Cover top well with cheese, tomatoes, olives and green onions. Bake for 20-30 minutes, or until center is heated. Serve topped with sour cream.